I had my first visit to Point Dume in Malibu, California, nearly eight years ago this month. At the time, it seemed like one of the most magical landscapes I had yet to encounter in life. There was a mix of surfer boys in the water, a select few girlfriends tanning on the beach and a handful of people walking up and down the sandy shores. It felt like a private reserve, a secret hideaway if you will. I fell in love. So, when the words "Ralph Lauren Home Point Dume Collection" were first uttered, I couldn't imagine a more perfect pairing of worlds. A favourite brand inspired by a favourite place. This is where the real magic happens. As many of you probably already know, the actual Ralph Lauren Home stores are another world in themselves. Each season the store is transformed to reflect new collections and the Ralph Lauren team do everything humanly possible to make you believe you are actually walking into a home. Complete with antiques, unique artwork, staged bedding and even personal pictures on the nightstands, this is a setup you want to be real and to be your life at that moment. I got a chance to step into Ralph Lauren's Point Dume home setup half an hour before the store opened earlier this week. It was a priceless opportunity, to be able to interact with the new setup one-on-one. It was an unparallelled moment to imagine that my life was built around a Ralph Lauren crafted home. Oh, what a dream. 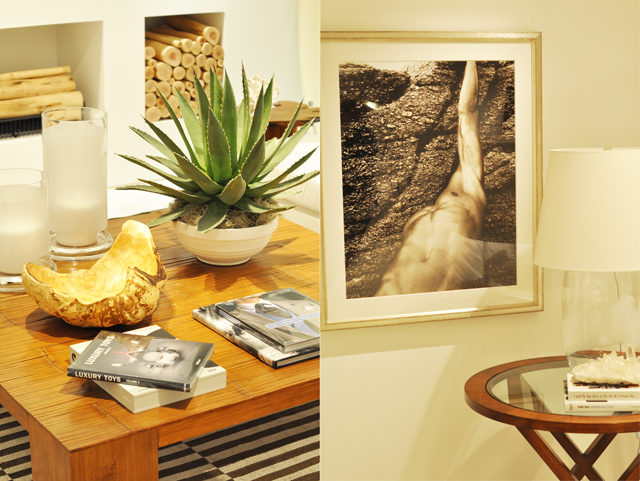 Walking into the Ralph Lauren Home Point Dume room you are immediately stunned by the vista laid out before you. On the back wall, the Ralph Lauren team have set up a window to make it look as if this room is in fact overlooking Point Dume in Malibu. 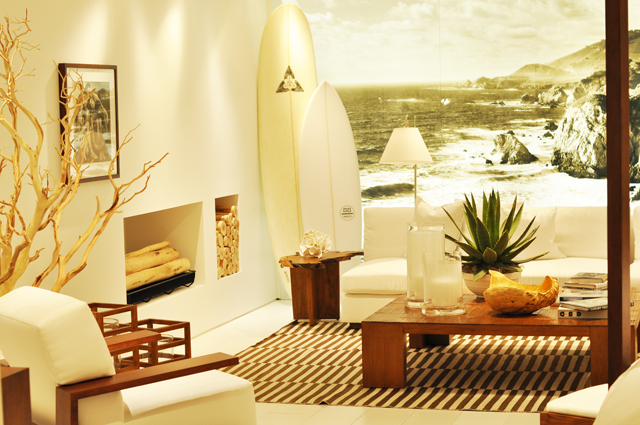 Surfboards are set as props next to a wood fireplace set into a beautiful and clean white wall. 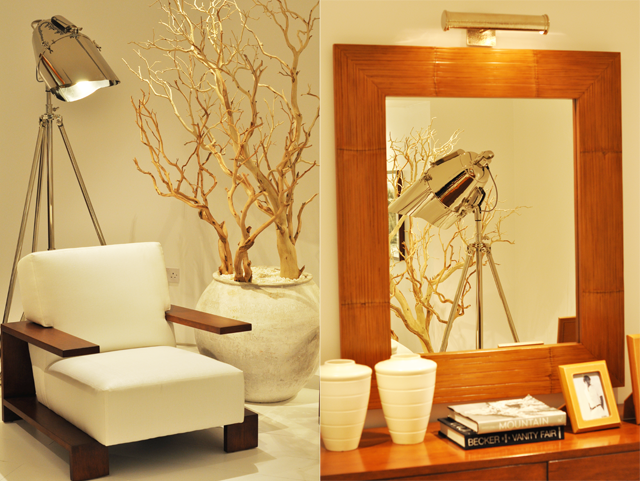 The room is set to focus on the details, starting with the most striking piece on display, the white wrap around sofa. From light to dark, we are drawn to the beautiful stretched bamboo table set at the heart of the room, which is elegantly decorated with colours that tie in the surroundings. The room is so simple, yet so perfectly put together with every piece serving a purpose. Moving backwards, we are presented with a set up that is usually the focal point of every Ralph Lauren home moment, the bed. 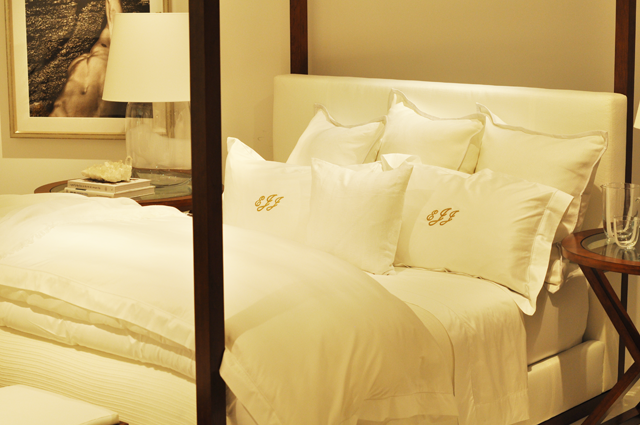 Ralph Lauren dresses a bed like no other. Truly, they are the masters of pillow layering and blanket throwing. They create a scene that is so heavenly you want to crawl in and take a nap, never mind the shoppers around you. This Ralph Lauren bed for the Point Dume Collection had a bit of a surprise, however. Notice the initials on the pillows? Oh yes, the initials of yours truly. 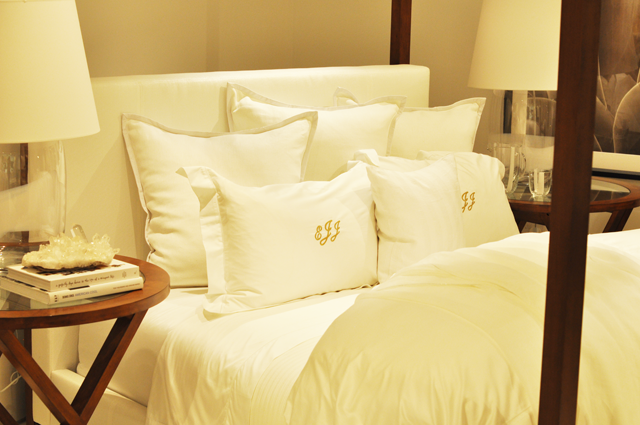 Ralph Lauren surprised me with two pillowcases that had been monogrammed with my initials and were on display as part of the Point Dume Collection. Monogramming in store is a new option that is available same day. As a Southern American, I can tell you that monogramming is part of my blood. Towels, robes, pillows, bags, you name it and we have it monogrammed. The trend is now coming back in full force and RL are ready to take action to service their client base as this grows in popularity. So just dropping in that this is the perfect present idea! More to come on this later. So there you have it, ladies and gents, the Ralph Lauren Home Point Dume Collection in all its finery. It's definitely worth popping into the Flagship store in London to have a closer look. You will get lost in the world the Ralph Lauren team have created, that's a guarantee.